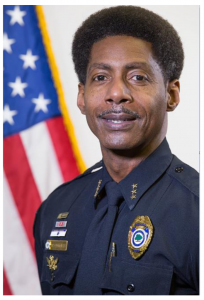 Chief Reginald L. Burgess, “Reggie” as everyone calls him, grew up in the City of North Charleston in two historical neighborhoods, Union Heights and Liberty Hill. He grew up loving sports and participated in various sports such as track & field, baseball, football, and basketball; ultimately, football being his passion. Chief Burgess graduated from Bonds Wilson / North Charleston High School in 1984 and attended Morgan State University in Baltimore Maryland after obtaining a full football scholarship. While playing wide receiver for the Morgan State Bears, he became a Sporting News Division 1-AA All- American, nominated on the Historical Black College Sports All- American 1st Team, received All-MEAC honors his freshman and junior years, and was selected as the All-MEAC First Team as the conference leading wide receiver. In Chief Burgess’ senior year, he was selected to several All-American teams and elected to play in the Freedom All-Star Senior Bowl in 1987- 1988. His childhood dream to play in the NFL never came to fruition, so he returned to his hometown in South Carolina where his law enforcement career began. In 1989, Chief Burgess decided on a law enforcement career with the North Charleston Police Department. He chose law enforcement partially because he always wanted to be a S.W.A.T. member. But most importantly, because he respected the rights that every citizen is afforded, and he wanted to help protect those rights. Chief Burgess rose through the rank structure beginning at the rank of Corporal in 1993 serving in the capacity of Patrol, a DARE and GREAT Officer, Crime Prevention, School Resource Officer, General and Narcotics Investigator, and the Office of Professional Standards. In 1995, he rose to the rank of Sergeant, the rank of Lieutenant in 1999, the rank of Captain in 2004, and the rank of Deputy Chief in 2007 overseeing the Special Investigations Division which included Narcotics, Traffic, Vice, Gang, Detectives, Bike Team, School Resource Officers, K-9, SPEED Team, DEA, Secret Service, ATF, and ICE Task Forces. In 2013, he was promoted to the rank of Assistant Police Chief where he was responsible for the supervision of the Deputy Chiefs and the department’s daily operational functions to include overseeing personnel decisions, compliancy, human relations, regulations, and budgetary reports. On January 11, 2018, he was sworn in as the Chief of Police for the City of North Charleston. Chief Burgess attended and received advanced education and training from the Southern Police Institute (SPI), and attended and received intensive training in the latest management concepts and practices used in business and government from the prestigious Senior Management Institute for Police (SMIP), and the US Secret Service Academy. In addition, he holds a dual Bachelor’s Degree in Criminal Justice and Sociology from Claflin University. Chief Burgess always recalls his mother telling him, “to thine own self be true” and he carries this philosophy with him in his personal and professional life. He truly serves the public and takes pride in preserving citizen’s lives. Reggie married his high school sweetheart and former Bonds Wilson / North Charleston High 1984 and Claflin University Homecoming Queen 1987, Tracy Burgess. They are the proud parents of Reggie Burgess II and Kristen Burgess. Chief Burgess has been a member of Royal Missionary Baptist Church, since the age of 8 years old and is a member of Omega Psi Phi Fraternity, Incorporated.